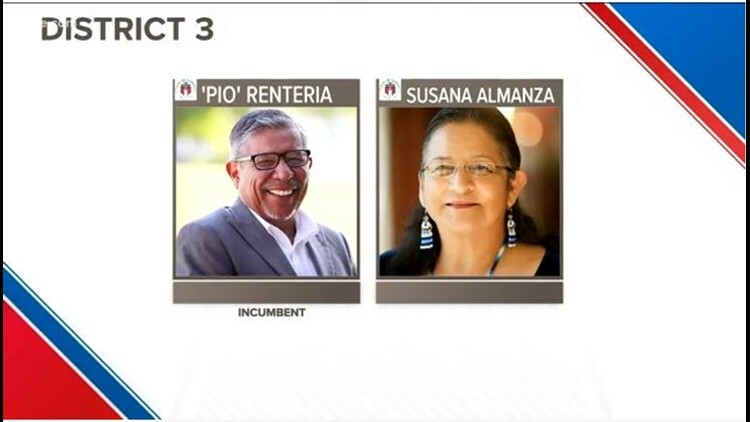 AUSTIN — Council Member Sabino "Pio" Renteria has defeated his sister Susana Almanza after they faced off for a second time in a race for the Austin City Council District 3 seat, according to Travis County unofficial results. People across Austin got to know Council Member Renteria and his younger sister Almanza four years ago when the two found themselves in the 2014 runoff for the Austin City Council. According to the unofficial Travis County results, Renteria won the election with 64 percent of the vote while his sister Almanza received 36 percent of the vote. Renteria, who is a lifetime citizen of Austin's District 3, retired from IBM after 34 years of serving as a computer and printer technician before becoming council member in 2015. Almanza, who is an East Austin native, is the director of the advocacy group PODER (People Organized in the Defense of Earth and her Resources). During an interview with KVUE political reporter Ashley Goudeau, Renteria said it was tough having to run against his sister in this race. "It's very difficult I have to admit that. Because, you know, I love my sister," he said. "It's kind of hard for me, especially this time around. I know it's going to get a lot dirtier and meaner." The most notable difference between these two political candidates are their views on high-density development. Almanza said she's not a fan of developers, while Renteria wants more apartments in Austin. The sitting city council members still as to vote Renteria's appointment. His second term will begin in January.